Caused by the evaporation of a huge sea 300 million years ago, an enormous salt reserve stretches deep underground from Madison County west to Lake Erie, north to Ontario, Canada, and south through Pennsylvania. In Geneva, New York the salt is only 200 feet below sea level, but because of the shifting of the earth's crust, the salt is much deeper as one goes south. Commercial salt production from brine wells began in the Finger Lakes on the shore of Onondaga Lake in Syracuse when it became difficult to obtain salt from abroad during the War of 1812 with England. The refining of salt was Syracuse's largest industry at the time, and it supplied salt to much of the country. The building of the Erie Canal allowed the bulky and low-priced Syracuse salt to be transported to Chicago and beyond relatively quickly and inexpensively by way of the Great Lakes. Although the Erie Canal was known by many names, those in Syracuse called it "the ditch that salt built." 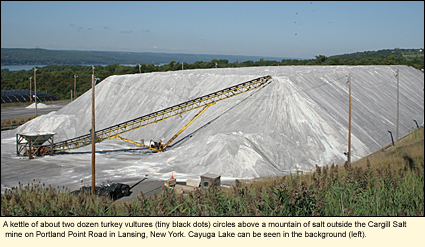 During the Civil War, salt production in Syracuse secured the North's salt supply. Unfortunately for the South, with the Yankee forces in control of salt mines in Virginia and Louisiana, those living in that region South couldn't buy salt at any price. The lack of salt is thought to be one of the many reasons why the South lost the war. The salt industry in Syracuse came to a close in the 1920s after causing considerable environmental damage to Onondaga Lake. Onondaga County Parks has created a salt museum on the shore of the lake in Liverpool from timbers from the original salt warehouses. Here, you can learn about the salt refining process in Syracuse and its connection with the Erie Canal. There are currently four operating salt mines and wells in New York State, all of which are in the Finger Lakes. None are open to the public. When the Retsof Mine was abandoned in 1994, 275 miners were without work. In 1997, several New York State businessmen started a new company named American Rock Salt. This was the first new salt mine in the country in 40 years. The Hampton Corners Mine, 10 mi./16 km. from the old Retsof mine, is considered one of the largest and most efficient salt-producing facilities in the United States. The company estimates that it will be able to produce 3 million tons of salt per year for the next 80 years and approximately 50 percent of the state's annual salt requirement. Cargill Salt, the world's largest marketer of salt products, is headquartered in Minneapolis, Minnesota. In 1997 it acquired the North American assets of Akzo Nobel Salt, Inc. Its 40-mi./64.3-km. long Lansing mine has one shaft about 2,400 ft./731.5 m. below the bed of Cayuga Lake and covers about 18,000 subterranean acres. This is the deepest rock-salt mine in North America. It produces about 10,000 tons of salt per day. This is one of two salt operations Cargill has in the region. 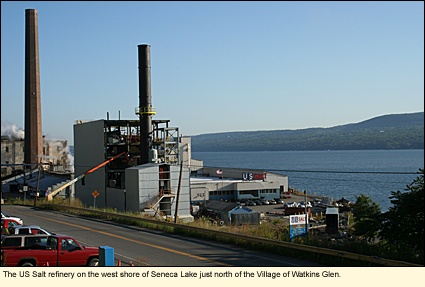 Unlike the Lansing mine, which is a true mine, the Watkins Glen refinery is a brine operation like US Salt, which is also located in Watkins Glen. This refinery has two wells. Through the introdution of steam into the wells, the salt is turned into brine and then processed into various products, including granulated salt for food, water conditioning pellets, and agricultural salt. The Cargill refinery is located at the southern end of Seneca Lake next to Seneca Harbor and across the street from the Watkins Glen Walmart. Owned by Akzo Nobel Salt, Inc., headquartered in Amersfoort, the Netherlands, this mine started to collapse after an earthquake on March 12, 1994. The initial collapse of the shale ceiling was followed by another and then complete flooding of the mine. It had been in operation since 1885 and was, at the time of its closing, the largest salt-producing mine in North America and the second largest salt mine in the world. Owned by US Salt, this refinery is tapped into a brine-producing well 1,513 ft./461 m. below the earth's surface that was discovered in 1882.